s readers already know, we shot the photos for the first three takedowns at evening outside on a small patch of green beside a parking lot in a small town, a village actually. So just to round things off, because Takedown #4 will be the last takedown presented, at least for a while, I’ve chosen to set the saint of takedowns, Sensei Mahoney, and his nemesis from the dark side, Anthony Fritz, in front of a more rustic setting – a cityscape at night. We loosely refer to Takedown #4 as the “sentry takedown” because it does appear as though someone were sneaking up behind a sentry with the aim of taking her down. Kids in my classes appreciate the reference. It suggests that they’re not straying too far from the comfort of the video games they often find themselves absorbed in. Actually, this takedown can be seriously employed in a military scenario along with the obvious options, from capture and control to rapid chokes and even more rapid neck breaks. Forgive me but I have to get this memory out of my system. Grade 9 Latin class (yes, Latin…no, not during the time of Julius Caesar although I am rather going on in years). We were all lazy on a lazy afternoon, sort of slouch back gaze down lazy, and if we all had had our shirts off, we could have maybe seen if there was any way a belly button could be made to wriggle without much physical effort or mental strain, a rebellion of sorts against the Latin declensions pounding our ears. Pueri pueri erunt…boys will be boys. Our septuagenarian Latin specialist was prowling between the rows of seats, reading aloud, the same gentleman who a month earlier managed to catch his teeth with one scoop of the hand as they fell out of his mouth mid-sentence, so we appreciate both his stealth and his quickness. 1. In following the principles of biomechanics, I was taught to approach in a straight line from my uke’s back however not with my chest facing his back directly but with the side of my body facing his back. The reasoning behind this: to minimize the amount of body area the uke could likely strike in retaliation. The groin, the solar plexus and heart, the throat…are all kept out of harm’s way. 2. In a polite class setting, we were taught by Shihan Forrester to place the palms and fingers of both hands across the uke’s forehead and pull his head backward…while bending our arms and pushing the back of his shoulders forward, obviously to disrupt his balance. That was in a polite class setting. 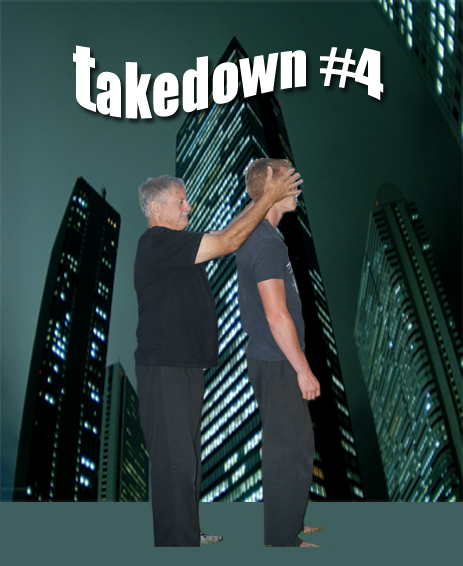 Discretionary conduct is advisable; this takedown can be dangerous, in particular if the head is snapped backward and downward rather quickly. In the most extreme circumstances, both hands turn into claws where the fingers dig into the eyes, the sides of the nose, the cheekbones and the sides of the mouth. You can guess the rest. It is important to note that the hand-forearm brace position also prevents the uke from turning around. 3. As you can tell from Mahoney’s position of stability vis a vis Anthony’s bent back posture, Mahoney is now able to come up with a few “endings” to the takedown. He can, if he wishes – and I hope he always does because Anthony is really at heart a good soul – merely throw Anthony down into the bushes, allowing the young man to display his knowledge of the back breakfall. Or, if Anthony has done something really abhorrent, throw the young man down and strike him on the head. Or, the nastier things…chokes, neck breaks…the list goes on. 4. 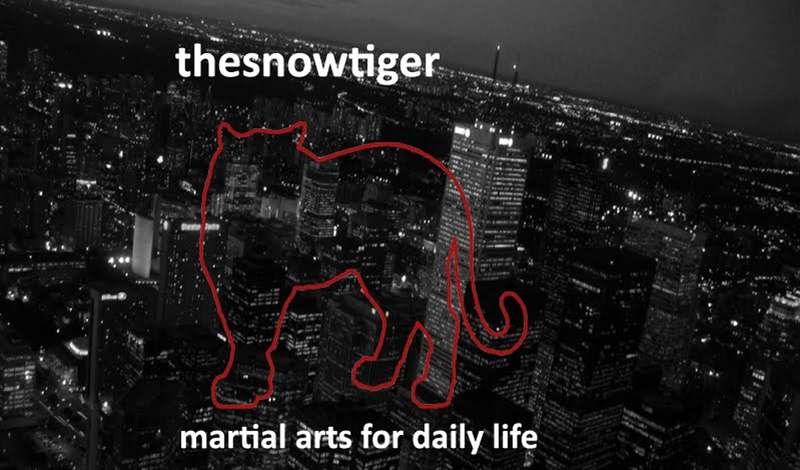 What is worth mentioning, as I have for the three takedowns that have come before, is that Takedown #4 is a weapon, not just a step-by-step single purpose technique utilized along one direction only, and should therefore be practised in a hundred different ways. We use it from the front, sides and back, against more than one opponent, with or without weapons (you can hold a knife in both hands), in a wide open field, in a hallway as narrow as a closet, on a stairway (be careful), and especially on the ground where concerns about rules are rather murky and the palms around the forehead suddenly become eye gouges or ear rips…murky, that is, until a court of law sheds light on the details. Takedown #4 can be a dangerous plaything. Self defense is what it is…defense. Don’t crank up the volume if there are noise laws in place. 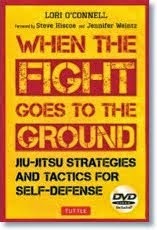 Readers might enjoy a class in the four takedowns via print where we put these techniques into play against a variety of defensive/offensive actions, typical of the way we would negotiate a Jiu Jitsu class. Or Karate class. Or Aikido. Or certainly Kung Fu. These takedowns are common property to all the martial arts. I think this would be a great idea. Let’s try it in a future post.